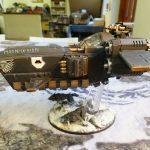 This was first featured on Space Wolves Blog in November 2015, but that blog has now been lost to the warp. In an effort to retain the information we have republished it here. 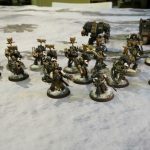 Hi guys, I decided to finally take some pics of my army as it is right now and post it to this blog. I’m not sure the pics are great, there was very little light when I took them, typical Irish skies I’m afraid. I began this in 2010 when I was living in England. 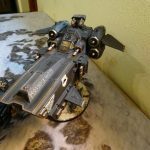 I had been out of the hobby in an active sense for about 10 years at this stage, but I thought about it all the time! I experimented with 3 models – one a typical blueish grey, one a pale grey and one dark grey. As you can see I went for dark (perhaps not quite as dark as the pics show). The colour I had in mind was the colour of basalt, or of a sky heavy with thunder and rain, about to break. 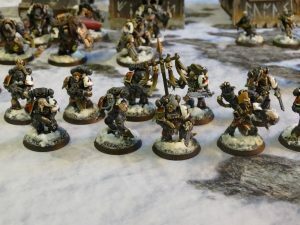 It has been a difficult colour to paint with and in hindsight I would have gone for the pale grey, but that being said I love my dark wolves. 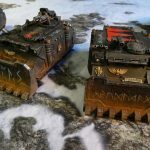 It’s just that many cool weathering techniques are limited by a dark colour. However, they do look like a bunch of teak tough hunters who have been in the field for years, which I’m very pleased with. 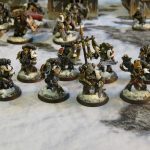 My wolf scouts are my favourite models. 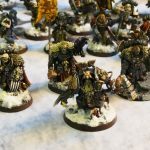 They may not be the best painted, but with them I covered new ground – these were my first conversions! Plastic has been a godsend to many of us and I’m no different. Being able to change their pose (let’s be honest the scouts kit it ugly as sin – so converting them is not exactly fraught with danger – you can only improve on it) dramatically changed their look. Many of my scouts are running in a crouched position. This is achieved by snipping the ankles and knees, paring down the belly so it forces the upper torso forward and often taking one leg off in its entirety and reposing it. Later I realised I didn’t need to fully remove much, just snip and re position and then fill in the gaps with green stuff. 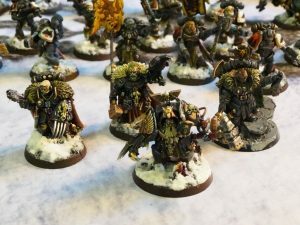 With my scouts as a constant project I went about creating the rest of my force. I have used heads that suited wherever I found them – WHFB, micro art studios and recently I got some Puppetswar heads that will look great. I love painting faces and it has leant my force great individuality. I was afraid of vehicles for a long time and it actually caused me to stall my project. I regret this now because once I got started I found vehicles very fast to paint. 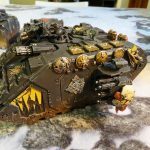 I use an airbrush, especially for vehicles and it makes all the difference. 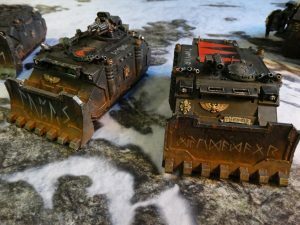 My land raider for example was painted poorly – the ink was done with a brush, which was a mistake, it looked terrible. Also, bizarrely, it smelled like poo! I can’t explain it, but that particular batch of badab black was clearly tainted by maleficarum! My mate’s dog actually ran away form it after sniffing it. But I airbrushed the whole thing grey once more and because I used that tool, no detail was lost (almost) and the ink was applied with the airbrush too. I only do the first two stages of painting vehicles with it now. I was determined to personalise my vehicles also. I have named them all, translated the word into Old Norse, then crossed that over into runic. 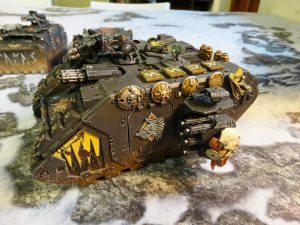 Each vehicle has (or will have) its name painted on it and some also have more traditional Fenrisian words on their dozer blades. I am seriously considering buying a Leviathan Siege Dreadnought from Forge World. It will be named “Ibn Rustah”, for those of you who get the reference 😉 I already have a dreadnought drop pod with which to deliver him onto my foes! I went through two iterations of snow basing. My first was my own recipe which involved baking powder, PVA and a pinch of GW snow. It was fine, but I’ve since moved on to the current recipe you see in the photos. This uses Secret Weapon Miniatures realistic water and model scenics snow effect. I also have ground glass also from SWM which I sprinkle on the wet snow or mix into slush sometimes. It looks amazing, I recommend it fully. I actually went and used this to put snow into the tank treads just after taking the photos, so they look pretty good now I have to say, but on tanks less is more when it comes to snow! One other reason I was willing to redo all my models bases is the advent of 32mm. I used simple ring expanders to make the bases, which meant I saved countless hours of heartbreaking snipping off of feet from bases. All I had to do was add some more gravel and snow around the edges. The models are a few mm taller after the process, but it looks perfectly normal. 32mm bases look perfect on space marines so again, I recommend giving it a go if you have the patience! So that’s it for now guys. I have lots more to work on with my army. 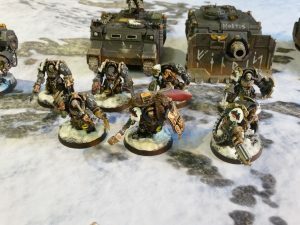 I have that lone wolf you see in the photos (he’s the one holding the head up in triumph), a wolf priest in terminator armour and Arjac’s Shield Brothers to complete in the near future. 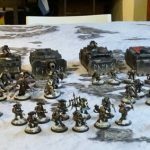 I love my army and after so long with it I feel I’ve really made it my own. 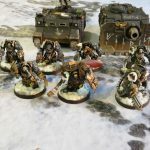 The Vlka Fenryka offer more scope than any other astartes force to do this in my opinion, so it’s definitely worth taking the time to do it if that’s something you think you’d enjoy.